Integer Programming: Theory, Applications, and Computations provides information pertinent to the theory, applications, and computations of integer programming. This book presents the computational advantages of the various techniques of integer programming. 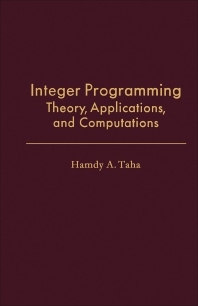 Organized into eight chapters, this book begins with an overview of the general categorization of integer applications and explains the three fundamental techniques of integer programming. This text then explores the concept of implicit enumeration, which is general in a sense that it is applicable to any well-defined binary program. Other chapters consider the branch-and-bound methods, the cutting-plane method, and its closely related asymptotic problem. This book discusses as well several specialized algorithms for certain well-known integer models and provides an alternative approach to the solution of the integer problem. The final chapter deals with a number of observations about the formulations and executions of integer programming models. This book is a valuable resource for industrial engineers and research workers. 1.1 What Is Integer Optimization?